Let’s talk trash. No, not smack talk. Literal trash. A common obstacle we face every day is the contamination unloaded at our yard alongside valuable wasted food resources. This is not only a nuisance and a hindrance to the composting process; it can also be a costly problem. 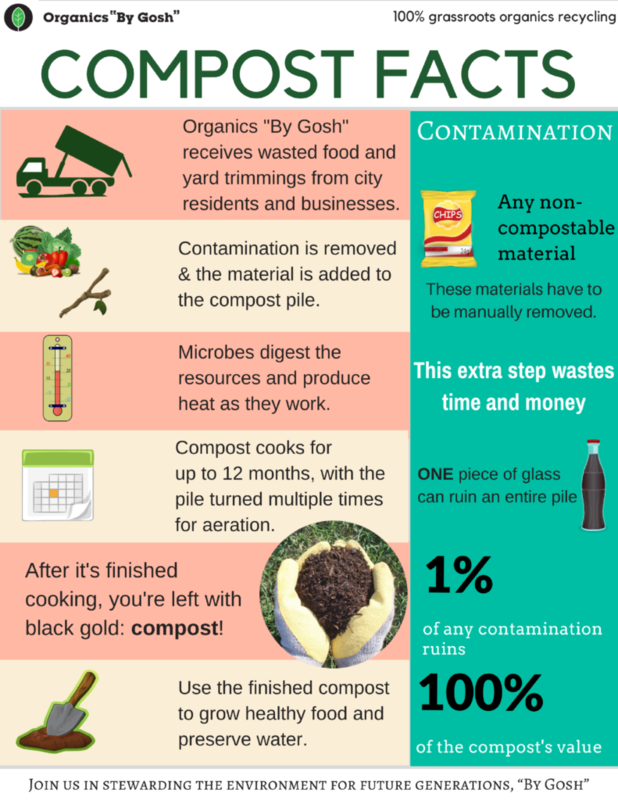 For a composting facility, contamination is any non-compostable material. *Why is glass such a major problem? Glass is nearly impossible to remove from a compost pile so one seemingly insignificant shard of glass can ruin an entire batch. Recycle instead! 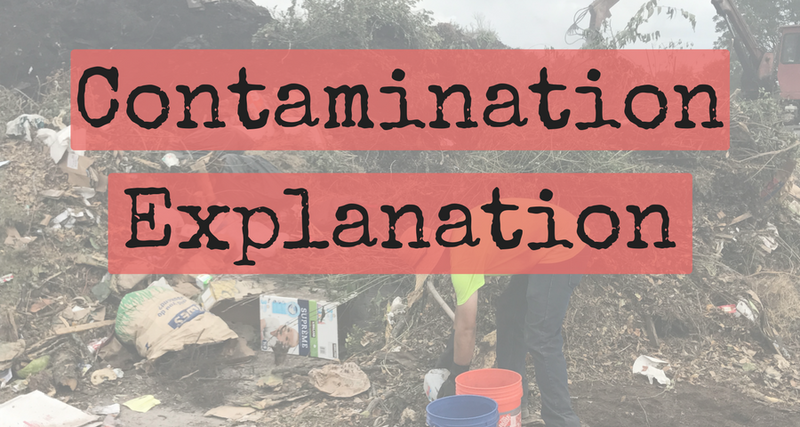 Why is contamination such an issue? Let’s go back to the basics. We all know how composting works and how to properly sort our waste, but what happens if we ignore all this advice? Since contaminants are non-compostable, they do not break down into the beautiful organic material we use to amend our lawns and gardens. Instead, they just loiter intact in the finished product. 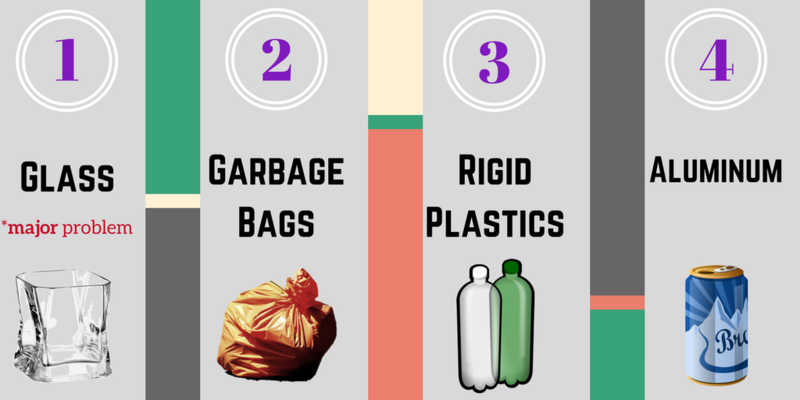 And no one wants to find little bits of plastic, glass, or Styrofoam in their gardens! Removing contamination also requires time, energy, and manpower. As a result the finished product becomes expensive. By properly sorting and preventing these contaminants from sneaking into the compost pile, we avoid this extra step and cost, which benefits everyone! Since composting is still a new, exciting concept for many cities and residents, procedures for collection, labeling, and education are not quite uniform across the country. “Going Green” has become increasingly popular, and while this is helpful for spreading the message, it can get confusing. Sometimes a green plastic bag may seem compostable, but it’s just a green plastic bag. Only BPI certified compostable plastic bags are accepted at our site—that way we know it’s the real deal. Any compostable bag must meet the ASTM D6400 standard or they will not properly break down in the compost pile. Luckily, great minds are already working on solving the contamination hurdle to ensure we continue on the right path to zero waste success. Creating new educational materials and developing consistent national composting standards have already proven to help with decreasing the amount of contamination. Another solution we try to reinforce frequently: working together! Collaboration between composting companies, cities, and residents is the easiest and most effective means of sharing knowledge and encouraging best practices. We are putting together a great blog post right now that complements this info – it’s all about the differences between compostable and biodegradable. I will send this to you as soon as we get it approved and posted – probablty next week.